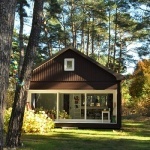 Wooden summer houses create comfortable conditions for the rest in the fresh air. They also may be a great item of decoration of the land plot near the wooden houses. Architectural forms give possibility for the architects to create some interesting designs. Each summer house which was built by our company is unique. Work proficiency and the great deal of the constructing forms enable us to build a high quality wooden house. A nice look and the natural beauty. The magic of the wooden houses is so huge that they will never be out of fashion. The wooden houses and wooden shops , summer houses combine the simplicity and the beauty . Ecological compatibility and safety. Wood is the natural and safe material. In contrast to other materials it does not emit toxic substances but on the contrary it is good for your health. It continues in its current form and has a resistant construction. It is not spoiled be temperature changes , wind and straight sunrays. You do not need to despair of the mechanic damage. All traces of the damaged wood are polished very well which cannot be said for other building materials. 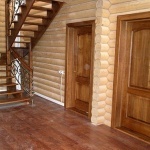 Wooden log summer house is an easy to pay one. And it does not take much time to build it. An easy to pay price will become a twist in your garden. 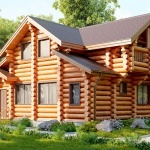 The company Karpaty-Dom will build a summer house in your land plot both summer and winter type. It will become an inalienable rest place for your family and friends. The client may choose the form of the summer house by himself. It may be done in a round, multifaceted , square shape. After a special wood-working inside we can adjust a fireplace or a barbecue grill. We may build a summer house dividing it into separate zones. In the one there will be a barbeque grill and in the other the room with the furniture. A summer house can be of a difficult architectural form. Everything depends on on the client”s wish. A wooden summer house needs much time. It is made of the wood when it is in a specified level of the humidity. For its longevity all the materials are treated with special liquid. We assume the possible load on the roof and the amount of the precipitations on it. 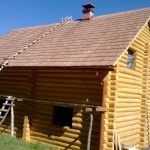 We follow all the rules and the requirements in building of the wooden houses. The purchaser may be sure that the construction will save its characteristics and the general look for the long period of time.